We hold in-house training days for schools and organisations wishing to introduce the Story Massage Programme to the children or adults in their care. Training as a group brings the benefits of shared experience and the opportunity to support each other in developing the Story Massage Programme in your school or organisation. We work with a variety of professionals including school based staff, community workers and therapists. Would you like to book an in-house training day? Cost: £1600 for up to 20 delegates, plus travel and accommodation. This includes the experience and expertise of two trainers plus a comprehensive training manual and certificate for each attendee. To discuss options, dates and venues: please contact Mary and Sandra. 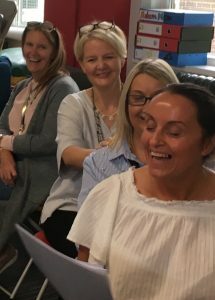 Here is a video of a staff at Thorntree Primary School sharing Story Massage on an in-house training day.